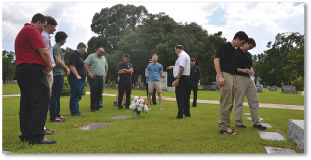 Gathered in a corner of Roselawn Memorial Park in Baton Rouge, beyond the sprawling ancient live oaks, angelic statues and massive headstones, a group of men stood quietly at the foot of a life-sized crucifix, studying the plaques on the ground. Leading the group was Father Matt Lorrain, director of seminarians for the Diocese of Baton Rouge, along with Father Andrew Merrick, director of vocations for the diocese. With that bit of background information, the crowd responded with “oohs” and “aahs,” completely comprehending the difference in the languages. That’s because these men were familiar with south Louisiana: its traditions, its foods and its cultures. They are seminarians studying for the diocese and this was their Back to School Retreat, Aug. 6-7 at the Bishop Robert E. Tracy Retreat Center in Baton Rouge. The stories continued with Father Lorrain pointing out the grave markers for other religious. The seminarians moved along, reading each marker, listening to the stories and background of each person who tread before them, each making their mark in the history of their faith. Some of the deceased were noted for the parishes they founded including Msgr. Dominic Blasco, founder of Sacred Heart of Jesus parish in Baton Rouge. Others had interesting stories such as Father Walter Kersey, a late vocation priest who, according to Father Lorrain, was raised in a prison environment because his mother was a warden at a women’s prison. Before becoming a priest, Father Kersey worked as a flight attendant. From there, the group moved on to grave markers of the sisters of the Franciscan Missionaries of Our Lady. Father Lorrain then explained how some of the streets around Our Lady of the Lake Regional Medical Center are named after them, including Hennessy Boulevard and Didesse Drive. At the end of the tour Father Lorrain told the seminarians they are “sons and grandsons in the ministry, so to speak” of the men buried at the site. He then mentioned that other priests were buried at other Catholic cemeteries or at other churches and mausoleums. The group finished by saying a “Hail Mary” and the Prayer for Eternal Rest. The retreatants then met at Sacred Heart Church where they heard more about the history of the priesthood and the Congregation of the Sisters of St. Joseph from Father Miles Walsh, pastor of Sacred Heart; Father Gerald Martin, pastor of St. John the Evangelist Church in Prairieville; and Sister Lucy Silvio CSJ. The remainder of the retreat included talks about human formation, spiritual formation, intellectual formation and pastoral formation. The men also visited St. Vincent de Paul Society. “I just heard a wonderful talk by Father Merrick about prayer and spiritual life, and he just knocked it out of the park, incredible talk!” said Deacon Dawson. For many of the seminarians, the retreat was a chance to catch up with others and establish friendships with some of the newer seminarian students. And, seeing new faces was exciting for Young. “It’s really encouraging to see that there are new seminarians and others who are joining us,” said Young.